This extra special anniversary edition of the New York Times bestselling Duck & Goose picture book is an egg-citing addition to any young readers' library. It's an unforgettable children's classic starring two beloved characters, and a must-have for any child's home library. Meet Duck and Goose, two young birds who mistake a polka-dot ball for an egg and have to master the art of cooperation--and sharing--to take care of it. But friendship is not always easy, as proved in this funny, accessible story. Young readers will instantly recognize themselves in these adorable and eternally optimistic characters. 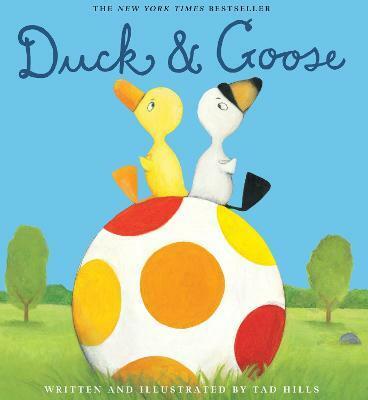 And this beautiful keepsake edition features extra content from the author on how to draw Duck & Goose. Tad Hills is the author and illustrator of the highly acclaimed New York Times bestselling picture books Duck & Goose; Duck, Duck, Goose; Duck & Goose Go to the Beach; How Rocket Learned to Read; and Rocket Writes a Story. He has created numerous Duck & Goose board books, among them the ALA-ALSC Notable Children's Book What's Up, Duck? ; Duck & Goose, It's Time for Christmas! ; Duck & Goose Colors! ; and most recently, Duck & Goose, Let's Dance! The Rocket series includes a board book, Rocket's Mighty Words, and two leveled readers, Drop It, Rocket! and Rocket's 100th Day of School. Tad lives in Brooklyn with his wife, their two children, and a dog named Rocket. Visit the author online at tadhills.com.